We love doing exciting projects so we couldn’t pass up the opportunity for SimGear’s latest project! The goal was to provide a custom coded product configurator for their custom motion simulators. 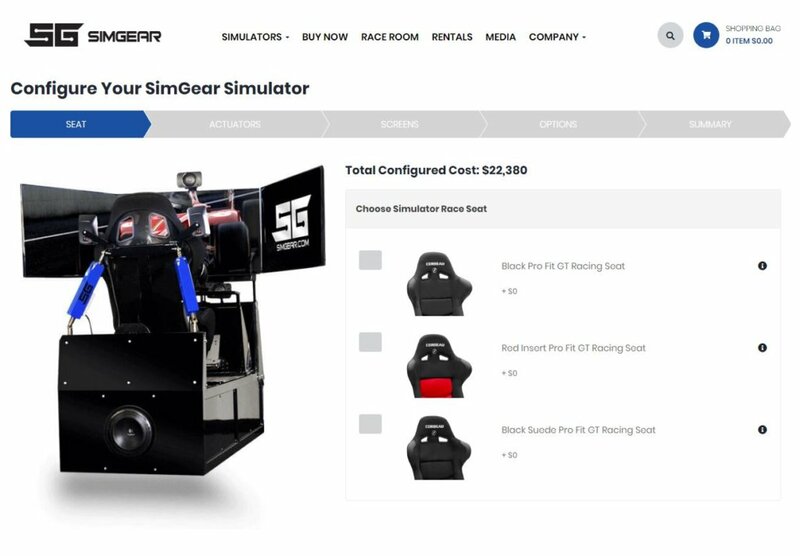 The configurator tool allows customers to go step by step through a series of questions to tally up the total cost of a custom motion simulator. Users are able to click the information icon to learn about certain features as well as progress forward and back if they changed their mind on a feature. The best part is when all is said and done, the user gets prompted to fill out a form that feeds data to HubSpot to capture the data. We built this custom tool on the jQuery / BootStrap foundation with search engine optimization in mind. Lightboxes are used for additional information that is useful to the audience. It is fully mobile responsive so that those on the go can still price out their dream simulator and submit their quote with ease. Want to check it out? Visit the page on SimGear’s website!